So my son has been deeply entrenched in the belief that girls are gross and worthy of hatred for some time now. He is seven. Though he does love me, and his sister, and his grandmas for that matter, he has told me, time and time again, that any person of the female gender in near proximity to him simply ruins his day, and he has acted appropriately so. This could be because they tell him he is cute and they like his hair and they chase him around. "Ya know mom? I think, when girls are around, that, maybe, I should shower because, well...girls don't like it when you stink." SHOWER?? He is seven! He has never taken a shower, because he is afraid of water beating down on him and getting into his eyes and nostrils. Now he wants to shower. For girls. Oh yeah. He also told me (and showed me) that he has "huge!" biceps. Could these two situations be related?? Could someone tell me what has happened here, and how I can reverse the effects? Maybe this new self-awareness will get him to stop picking his nose? Hey Super Archie with HUGE biceps...are you about to pick your nose? Is that an, "I HEART Picking" emblem? 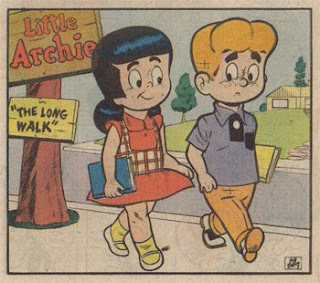 Do Betty and Veronica know about this? I am sorry you are having a hard, hard day. Probably related to the darn time change. Our bodies are very sensitive to eating and sleeping differences. Your post reminded me of when my oldest daughter was in grade school. One of the mom's came up to me after we were watching our kids' school bus leave. She thanked me because her son started combing his hair and taking baths more often. He had told her he did it because Bethany (my daughter) was going to be at the bus stop every day. He must have developed a crush on her. She never knew!!!! Too funny! You need to tell him it's not all about the muscles or the cleanliness. My seven year old, Emma, told me how much she likes Ethan in her class. I asked her why she liked him better than any of the other boys. She answered "he NEVER pulls any tallies". Let's hope she stays away from the bad boys.